We constantly hear that our current energy system is not sustainable as it is completely dependent on Fossil Fuels – coal, oil and gas, and that these non-renewable resources will eventually run out one day. As their collective name indicates, “fossil fuels” are formed from fossils, the preserved remains of long-dead plants and animals buried deep underground. Buried over the course of hundreds of millions of years, these carbon-based deposits have been converted over time by the immense heat and pressure of the Earth underground into such combustible substances as petroleum oil, coal, natural gas. Fossil fuels are a popular source of energy because they are considered convenient, effective, plentiful, and inexpensive, but are fossil fuels renewable and what are fossil fuels used for. Fossil fuels have made a staggering significance to the world we live in over the last few hundred years with oil, natural gas, and coal being the primary sources of energy that drives our modern world. These mineral resources are currently being extracted from the Earth’s interior with their current rate of extraction and combustion exceeding by far the rate of the replenishment of these resources. Burning fossil fuels provides the energy we need but in the process releases harmful emissions into the atmosphere that are both pollutants and toxic to animals and plants. Some of these emissions are responsible for global climate change, the greenhouse effect and for changing some of the Earth’s delicate eco-systems. But there are advantages in burning fossil fuels, we get heat and energy as well as powering our transportation systems and it is fossil fuel energy that is driving our world. A fossil fuel definition is one that describes fossil fuels as a nonrenewable or sustainable carbon based fuel which is finite in practical terms, so here are some interesting fossil fuel facts. Petroleum is often thought of as just crude oil, but petroleum is a complex mixture of hydrocarbons that occur naturally within the Earth either in liquid, gaseous, or solid forms. Petroleum is present all over the world making it the most widely used fossil fuel. Petroleum is composed of carbon and hydrogen produced from microscopic plants, bacteria and algae that lived in the oceans millions of years ago. When they died, these plants and bacteria fell to the bottom of the ocean and mixed with the sand and mud on the ocean floor. Over time and with pressure, heat these dead single-cell plants or planktonic animals were converted into petroleum. While the generalisation of petroleum is classified as “crude oil”, there are different grades of petroleum oil based on its specific gravity, ranging from heavy to light. Petroleum on its own can not generally be used as when extracted from the ground it is a mixture oil, water, sand and other organic matter. Then it needs to be refined producing a variety of products. Gasoline or petrol is the most common refined petroleum product, but others include diesel fuel, fuel oils, and gases such as propane, or liquid petroleum gas (LPG). In the past, natural gas was erroneously considered merely a waste product of oil recovery processes but nowadays we use fossil fuels gas for heating our homes, cooking, electrical power generation, and other such purposes. Natural gas produces much less toxins and pollutants than petroleum, so many people believe that it makes an ideal substitute for petroleum. Natural gas is an odourless, colourless, highly flammable gaseous hydrocarbon which is also lighter than air and consisting primarily of methane and ethane, though it may contain others such as propane or butane. The natural gas we use as a fossil fuel energy for heating and cooking is predominantly methane, with the other gaseous components removed. As methane gas is naturally odourless, the gas supply companies add traces of smelly compounds to the basic natural gas so that we can smell it when there are gas leaks and avoid danger. Natural gas has many advantages over petroleum. It burns more cleanly, producing no toxic by-products or ash except for low levels of carbon dioxide and water, so it does not cause the same degree of air pollution as other fossil fuels. Natural gas is also very safe as it does not pollute the soil or groundwater should there be a leak. Processed liquid forms of the natural gas such as propane and butane, are called liquid petroleum gas, or LPG, taking the place of gasoline as a fuel for cars and buses. Natural gas is the cleanest fossil fuel and has many advantages, but the biggest disadvantage is the supply of natural gas, which being a fossil fuel energy will eventually run out. Coal is by far the most abundant fossil fuel supplying about one-quarter of the world’s energy needs. Coal is hydrocarbons in solid form being made primarily of carbon and hydrogen with small amounts of other trace elements such as nitrogen and sulphur. Coal looks like black rock, blackening everything that it touches. In years gone by it was even called “black gold”. Like petroleum, fossil fuels coal is derived from dead carbon based plants and animals that had originally grown in swamps full of giant trees and other plants in a warm and humid climate. Over millions of years, these swamp plants were compressed and heated by the Earth turning them into coal. As a result of these large areas of swamp land, coal can now be found all over the world. Coal is recovered through surface or underground mining. But not all fossil fuel coal reserves are the same. 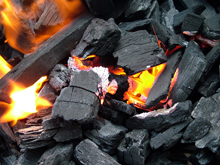 Coal as a fossil fuel is ranked by its moisture content, its calorific value, or the amount of heat energy that is released when coal burned and its mineral ash content after combustion. The three factors that determine the quality of coal are: the time in the ground, the compression pressure, and its exposure to underground heat. There are several types and rankings of coal from lowest to highest, depending on how pure the carbon is, which also corresponds to how old the coal is, and these are lignite, sub-bituminous, bituminous, and anthracite. Bituminous coal is the most abundant. The biggest disadvantage of coal as a fossil fuel energy is that it is not environmentally friendly. Burning fossil fuel coal produces large amounts of pollution, which contributes to global warming and acid rain. Also, mining coal damages to the environment. Using these types of Fossil Fuels as an energy source is a relatively recent occurrence, but other uses of fossil fuels date back centuries. While fossil fuels are widely used and widely accepted, there are ways to make fossil fuels less polluting, such as the use of clean coal technology which mixes the coal with renewable biomass or using both gasoline and LPG in hybrid auto-mobiles. Alternative to fossil fuels are being found and used everyday, but it remains to be seen whether fossil fuels will continue to meet the majority of the world’s energy needs or if the use of renewable resources such as wind, water, or solar energy will eventually surpass petroleum, natural gas, and coal. Regardless, it must be acknowledged that the supply of these non-renewable resources is finite, and therefore they should be used sparingly and wisely. Hi everyone, I think that solar energy would be better then fossil fuel because solar power is natural you dont have to travel around the world trying to find fossils when the energy that you do need is right above you. The less we use them the longer they will last, that is logical. We need to cut down on their use for our own good if for no other reason. God help our children.